It’s that time of year when hopefully, you have buckets of jalapenos growing in your own garden or have access to a Farmers Market. Usually, you can pick up a small bag of these hot peppers for relatively cheap, or free….if you grow your own. 1. We dice them small and dry them to use all winter long in soups and salsa. 2. We make our famous jalapeno jelly. This recipe couldn’t be easier and even someone who hasn’t made jelly before should give it a try. 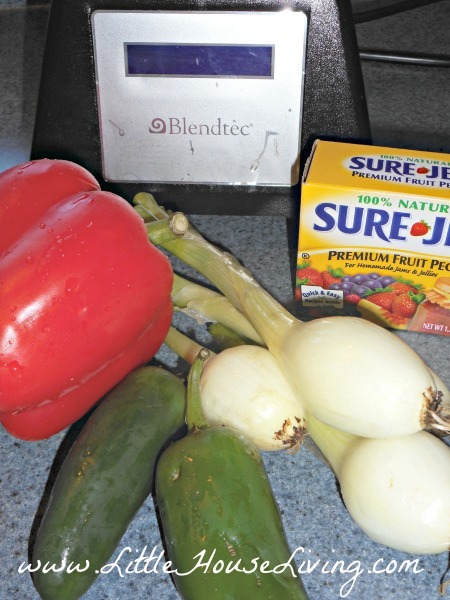 Place these peppers and onions in a blender or food processor to chop up into small pieces. Be sure to wear gloves when handling the hot peppers. I always remove the seeds on the hot peppers, but you can leave them, if you really like heat. Once chopped finely, add in 1 1/2 cup apple cider vinegar. Place in a large saucepan and add in the box of SureJell. Bring to a boil. It won’t take long to bring this up to boiling. Use a whisk and stir continuously. 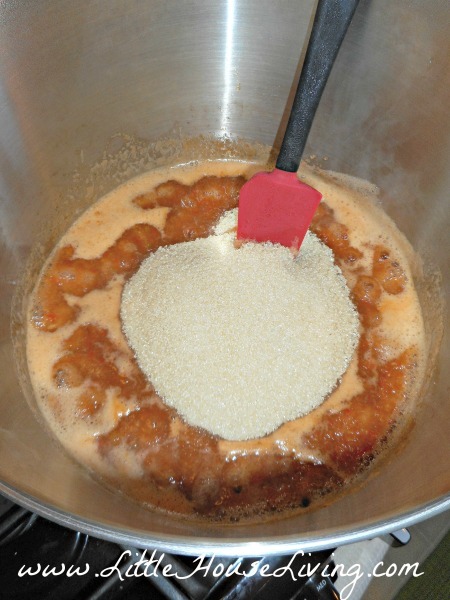 Once boiling, quickly add in 6 cups of sugar. 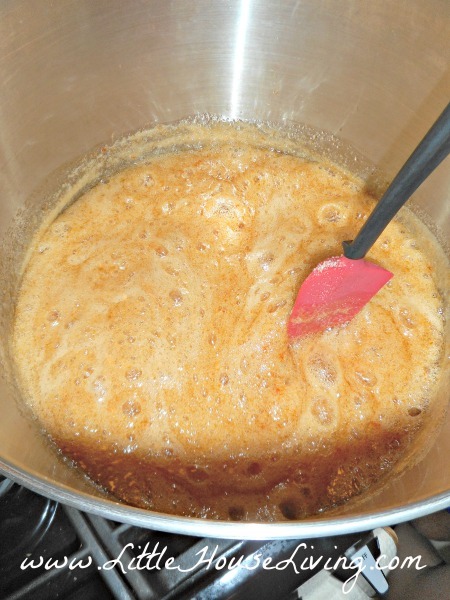 Bring the mixture, with the sugar, up to a boil. once again, and let boil for 1 more minute. If you want to eliminate the foaming, you can add in 1 Tablespoon of butter. Shut off the heat and place jelly in clean jars. I use half pint jars. 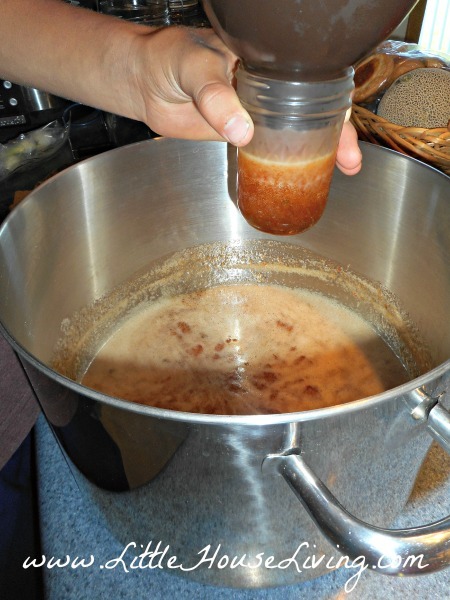 This recipe will make 7 half pints. 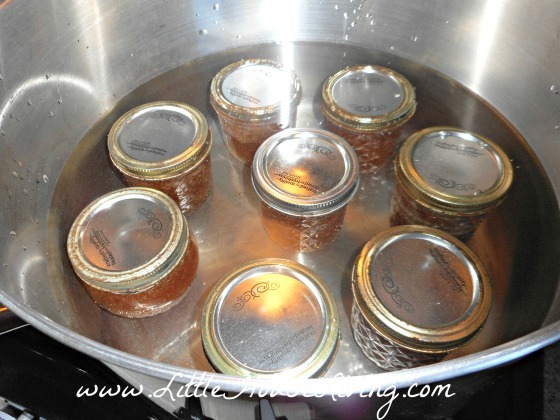 Once you have the jelly ladled in the jars, wipe the rims clean, and place the lids and bands on them. Tighten. Place in water bath canner for 15 minutes to seal jars. Our favorite way to have our finished jelly is to take 8 ounces of cream cheese and soften it. Spoon the jelly over the top of the cream cheese and serve with crackers or tortilla chips. This is great to take as an appetizer when getting together with friends or it makes a beautiful gift or part of a gift basket for the holidays! This is a family favorite jelly and one of our most requested recipes!! YUM! We also love pepper jelly. It is wonderful with chicken or pork as well as on cream cheese. However, I have given up using pectin as my jams & jellies never set with pectin. For my pepper jelly I use about 1 1/2 cups of crab apple juice instead of pectin and the jelly sets beautifully. Its really good when you with chicken. Just add to the top before you bake the chicken or saute bits size chicken and melt the jelly with it. Awesome! We were buying a pepper jelly from Costco pretty regularly. But then last Fall, they quit carrying it and said it was only a “seasonal” item. So I have planned on just making our own since then. I specifically grew jalapenos just for this, but didn’t have a recipe yet. Now I do. Thanks so much! Well, this is an embarrassing question for a Texan, but here goes! I don’t cook with jalapenos because they are too hot for my tastes, so I have no experience…With boiling that much jalapenos, doesn’t the steam become an eye irritant? I have extremely sensitive, inflamed eyes due to an autoimmune disease, so I need to know. But my family members and friends would love this recipe if I am brave enough to risk it. We made this yesterday. Just wondering if 1 1/2 c. of Apple cider vinegar is correct. That is all I taste. Will the flavor mellow with time? Yes, that amount is correct, after cooking you should not be able to smell/taste the vinegar in the recipe. Did you add the correct amounts of sugar? 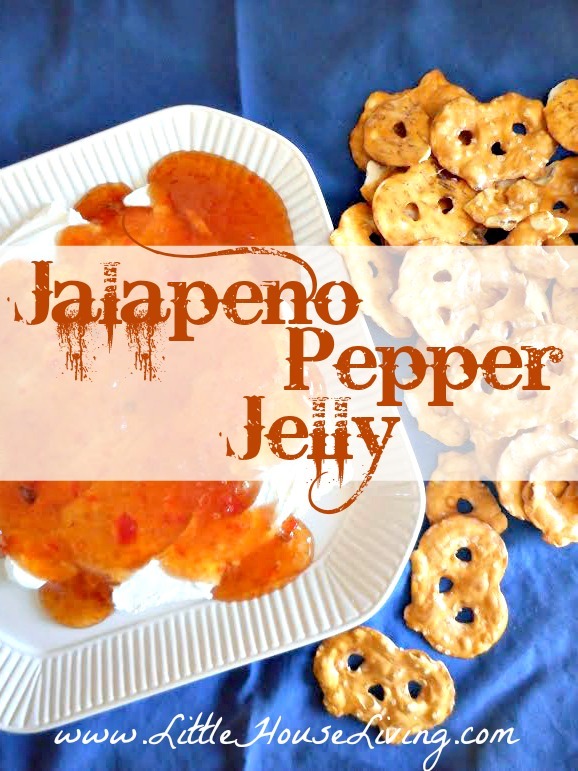 LOVE jalapeno pepper jelly! There’s a seafood place in Myrtle Beach that serves jalapeno pepper jelly as a dipping sauce for their fried calamari, it’s AMAZING! I hadn’t heard of making jelly from jalapenos until a few weeks ago. It sounds very interesting–I’ll have to try this sometime! Found you on Merry Mondays. Thanks for sharing! I’m so excited you shared this! My husband has been eyeing Jalapeno Jelly at the Farmer’s Markets for the last 2 seasons now. I have an abundance of Jalapenos this year in my garden–I’ll have to use your recipe to surprise him with some homemade jelly! Looking forward to seeing what you share next week at the Merry Monday Link Party!! I use only the Jalapeno peppers without the bell or sweet peppers. 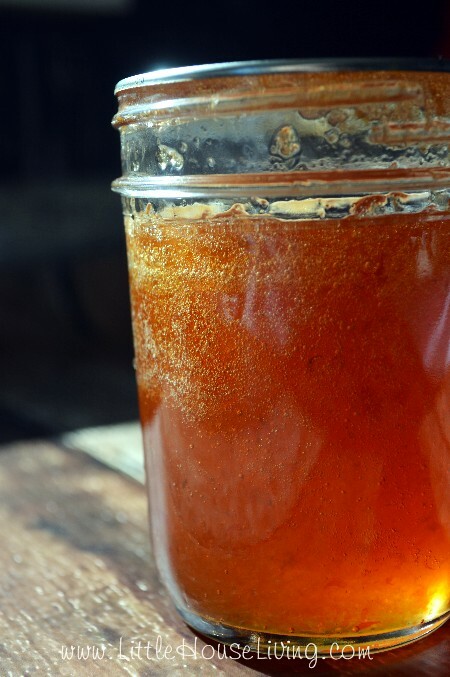 Try mixing a jelly jar of pepper jelly with a jelly jar of peach preserves for a glaze for pork of any kind. My family loves it one pork loin. Yummy. While making my pepper jelly I always keep the kitchen window open and it seems to help dissipate strong smell of the peppers while cooking them. Some one said they had no luck with pectin they should try using a liquid pectin when making pepper jelly. Certo is my favorite to use. I still use powered pectin but not with everything. 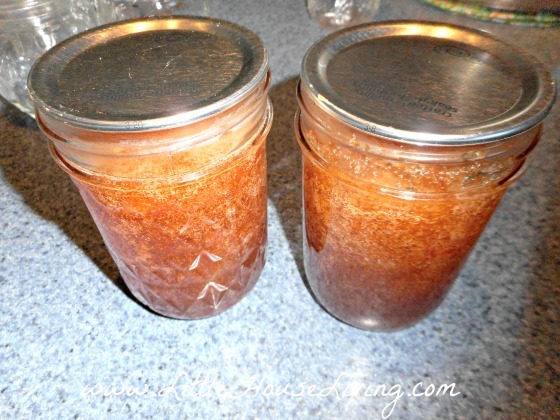 Have been canning for well over fifty years and have tried lots of different things. Friends send me strange suggestions and I will try at least one cooking. LOL Not sure that is dumb or not but I love to try most anything. I have been making the jalapeno jelly with Sure-jell for several years and it always turns out. It is not a jelly that ‘sets’ all the time, but is just as good unset on the cream cheese eaten with crackers. 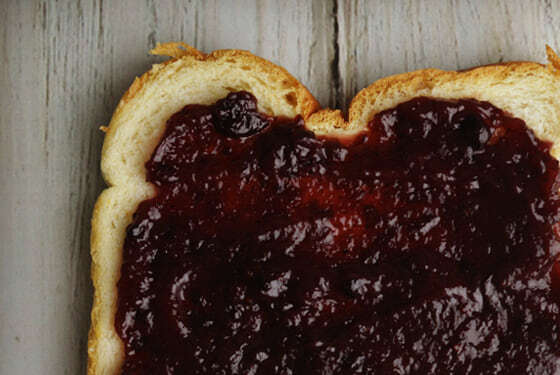 The jelly will at least ‘thicken’ even if it doesn’t set like fruit jams and jellies. 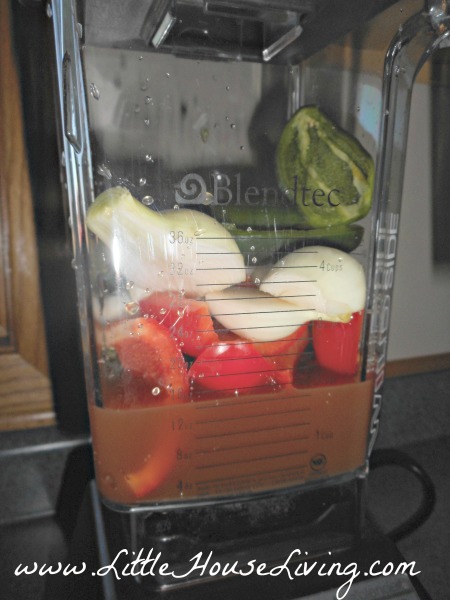 Easy to make when using a food processor. I always wear gloves when working with jalapeno peppers and keep your fingers away from your eyes! I remove the seeds, but am tempted to leave at least some of them to increase the heat. I just wanted to check on the ingredients. In the directions it lists apple cidar vinegar but not in the ingredients. So there is 1 1/2 cups apple cidar vinegar in the jam?? Hi! Thank you for this recipe! My husband and I tried it last night. The recipe tastes very good but I noticed that it didn’t set. Is the Sure Jell dependable or does it depend on what batch you get and doesn’t work if it wasn’t stored properly? Is there an alternative that works better but won’t affect the taste? Thank you! Hi – The recipe calls for one large onion but any idea how many ounces or cups that is? I’d like to try this with a Vidalia onion but am not sure if that’s too big… Thanks! A large onion would be around the size of a baseball.